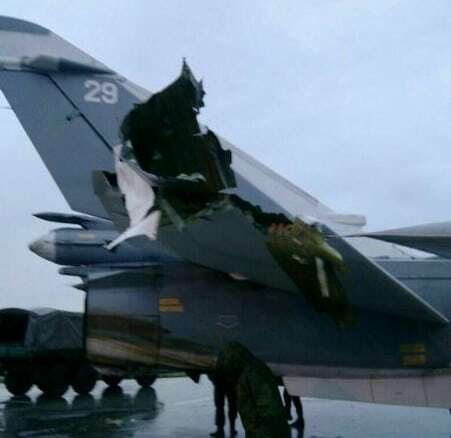 Photos appear to confirm that an attack on Russia’s main airbase in Syria has damaged several Russian warplanes. On Thursday, the Russian Defense Ministry acknowledged the December 31 attack on the Hmeimim airbase in Latakia Province in western Syria and said two troops were killed, but it denied reports that seven warplanes were destroyed. 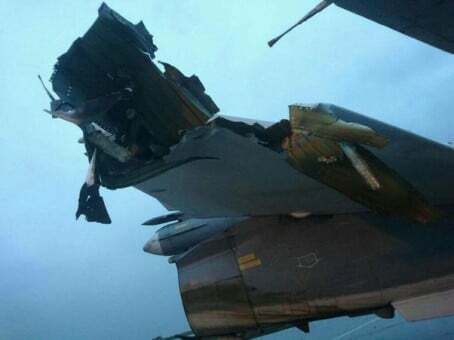 However, pictures on Friday appeared to verify the claim in Russia’s Kommersant newspaper that four Su-24 Fencer attack planes, two Su-35S fighter jets, and an An-72 tactical transport were struck. 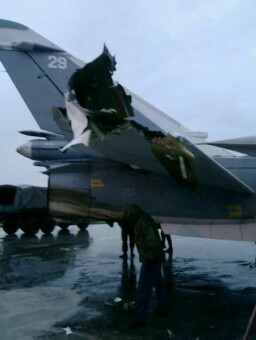 War correspondent Roman Saponkov, on the Russian site VKontakte, claimed as many as 12 fixed wing aircraft and helicopters were damaged, although he said some of the Su-24s and Su-35s had been repaired and were operable. Past satellite imagery has shown as many as six Su-35s and almost a dozen Su-24s, as well as other fighter and ground attack aircraft including the Su-25 Frogfoots, on the ground at Hmeimim. The details of the attack are still unclear. The Ministry said on Thursday that the assailants were “a mobile militant subversive group”. No rebel faction has claimed the attack. Rebels in Latakia Province have occasionally targeted the base with Grad rockets, but most have been intercepted by Russian defenses, meaning that a large volley would have to be launched for a chance of getting near targets. An alternative theory from local sources is that a “corrupt” regime militia or a Syrian Army unit may have carried out the mortar assault. This has been given some substance by commentary from Russian outlets questioning the reliability of Assad regime personnel around the perimeter of Hmeimim. Analysts have also noted that satellite imagery has shown warplanes parked close together without any defensive bulwarks between them. This positioning increases the chance that a limited attack could set off a chain reaction damaging multiple aircraft. The Russians have also stored live munitions in close proximity to tactical aircraft. The Syrian Network for Human Rights reports that at least 6,517 people were detained in Syria in 2017, including 551 in December. The pro-opposition SNHR said that the detainees included 434 children and 760 women. Of the detainees, 4,796 people were detained by the Assad regime; 843 by extremist groups, including 539 by the Islamic State; and 647 by the Kurdish YPG militia. Another 231 were held by groups which could not be identified. Damascus and its suburbs were the site of 1,440 detentions. There 981 in Deir ez-Zor Province, 658 in Aleppo Province, 588 in Raqqa Province, 514 in Hasakah Province, 493 in Dara’a Province, and 455 in Hama Province. The SNHR said it has recorded more than 117,000 arrests since the beginning of the Syrian uprising in March 2011, 99% of them by the Assad regime. In another report, the SNHR said 232 people were killed under torture in 2017. Of these, 211 were slain by the Assad regime. In August 2013, pictures brought out by a defecting military photographer established the deaths of thousands of people from abuse in regime prisons. Amnesty International later summarized that between 5,000 and 13,000 detainees were executed in Sednaya Prison, near Damascus, between 2011 and 2015.